Home / Magnets & Magnetic Materials / Neodymium Magnets / Neodymium Magnets Made to your specification! Please call us on 01268 768 768 to discuss your requirements. Buying from us is buying direct, we either manufacture or import, either way we can give you the best prices in the UK, Fact. 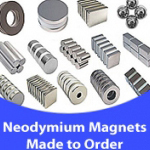 Whatever size, shape or style of neodymium magnet, we can make it!